Visit gruntjs.com/plugins listing to know about all the available plugins in GruntJS. In order to use GruntJS, you first need to install Grunt's command line interface (CLI) globally using following npm command. The Gruntfile.js or Gruntfile.coffee is the main file where you need to configure all the tasks for your application which you want to automate using different plugins. 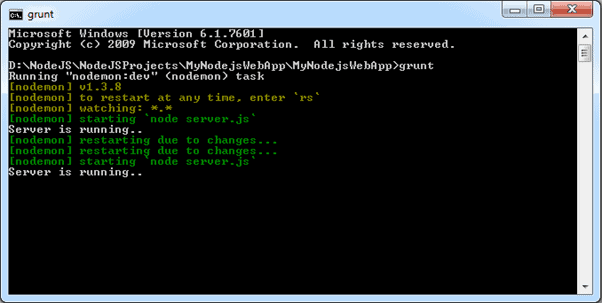 Let's see how to use grunt-nodemon plugin to run node monitor of your Node.js server. First of all, install the nodemon plugin into your application using following command. Now, open command prompt and navigate to your project folder and write command:grunt. This will start monitoring your project as shown below. Now, whenever you change any of your JS files it will restart the web server as shown below. This is how you can use various GruntJS plugins for the Node.js application. Visit getting-started guide to learn more about GruntJS and configuring-tasks guide to know how to configure different tasks.